I am a summer baby. I was born in the midst of a heatwave in July 1990 and despite the sunshine, my mother apparently insisted I was brought home swaddled in a blanket. Ever since then I have craved the sunshine months, of which there are far and few between in Scotland, especially up north in windy Aberdeen. The weather here often teases you – today I went for a run in between bursts of showers, howling wind and blasts of heat from the sun. Yet I wouldn’t change it. I like how summer keeps us on our toes – as long as my beloved T in the Park is drenched in sunshine I will be happy with the longer days, clear skies and a mild temperature. So it should seem surprising that I am bringing you an autumn inspired post today when I should be grasping the last of summer with my finger tips. But the idea of cranberries, toasty pecans and the warming notes from a smash of spices were too much for this summer baby to resist. I think I may have fallen in love with the amber tones of autumn. Aberdeen is such a winter city it almost hurts. Because of its proximity to the sea we are often battered with winds, chills and the dreaded May snow. But after a few months of enduring its harshness, I have come to find it slightly endearing. I am starting to find myself looking forward to pumpkin spice lattes, my leather studded boots and my cosy winter coat. So perhaps it isn’t at all strange I want my breakfast to remind me of the weather to come. It may seem a lot of faff to make your own granola but I promise this recipe will absolutely change your mind. Although the supermarket bags are cheap, a quick scan of the ingredients almost always lists sugar and even worse, palm sugar, near the top. This version omits the need for any sweetener other than the natural taste of honey and the spices and cranberries more than make up for a processed sugary taste. Olive oil may seem a strange replacement for butter, but as Sara adds in her book, the flavour disappears as the granola cooks, leaving the warming scent of pumpkin pie to permeate your kitchen. 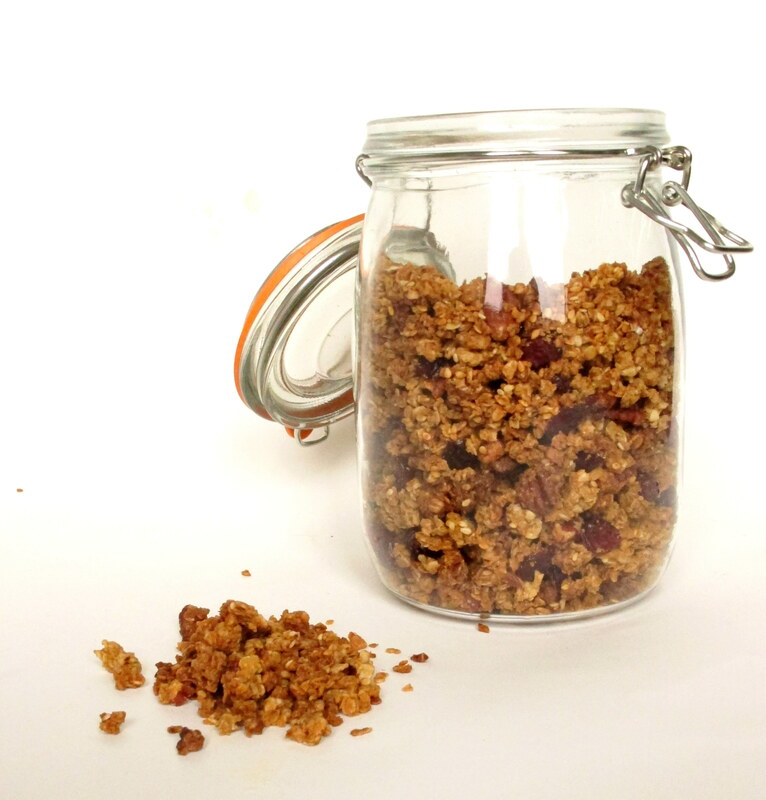 It may not be autumn yet, but this summer baby is enjoying bowls of this granola in the last of the sunshine. Tip: In the UK, canned pumpkin puree can be difficult to find but it is much nicer to skip the preservatives and make your own. 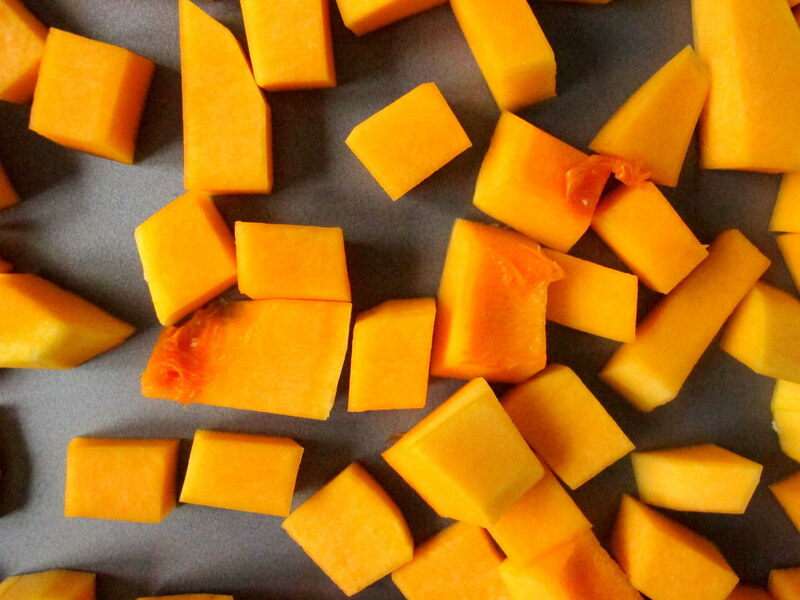 Culinary pumpkins aren’t in season yet but butternut squash works just as well. Peel and cut into 1cm cubes, place on a baking sheet and drizzle with a little olive oil before placing in a preheated oven at 200oc/180oc/Gas Mark 4. Keep your eye on the pieces and turn as they begin to brown. Once soft, remove from the oven. 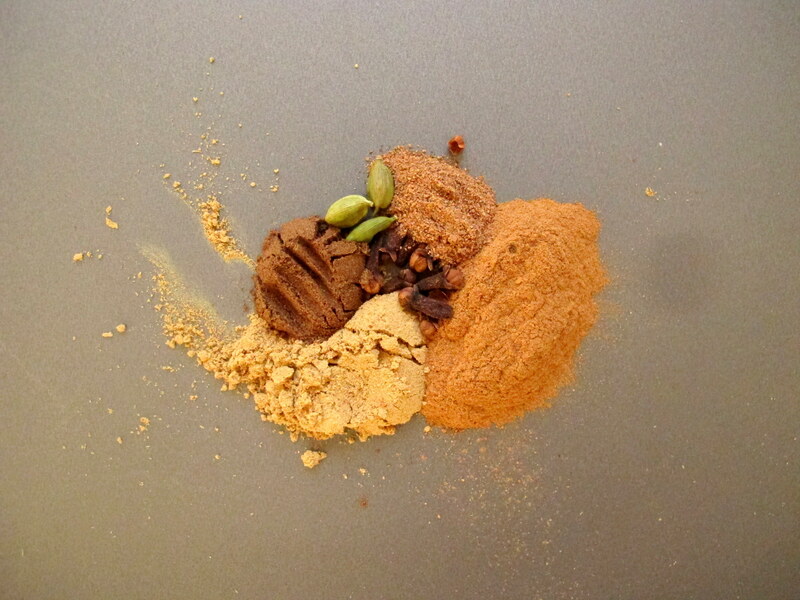 Measure out 90g and blend in a food processor or using a stick blender then use as required. The remaining pieces are great cold in salads or could be used to make this Roasted Butternut Squash Soup. Preheat the oven to 170oc/ 150oc fan/ Gas Mark 3. In a large bowl, whisk together the pumpkin puree, honey, olive oil and pumpkin pie spice. 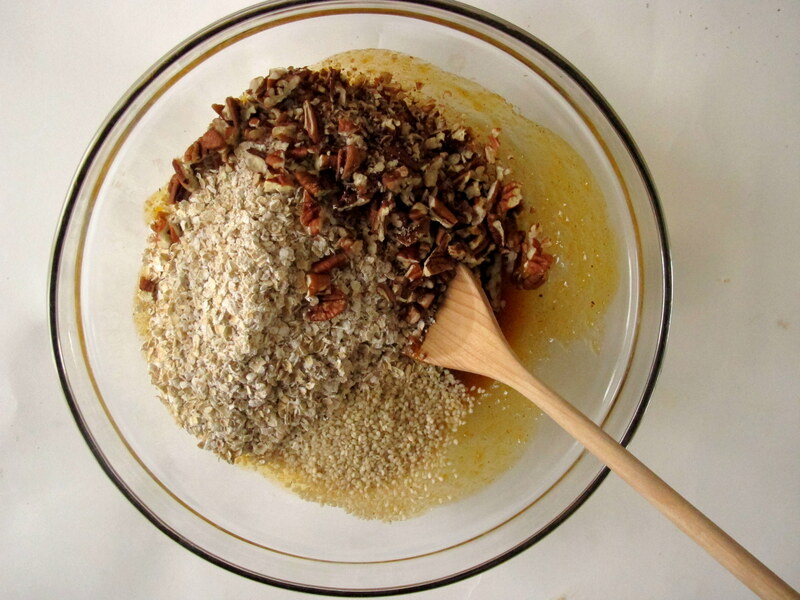 Once combined, add the porridge oats, pecans, sesame seeds and a pinch of salt. Stir until combined and the mixture is wet. 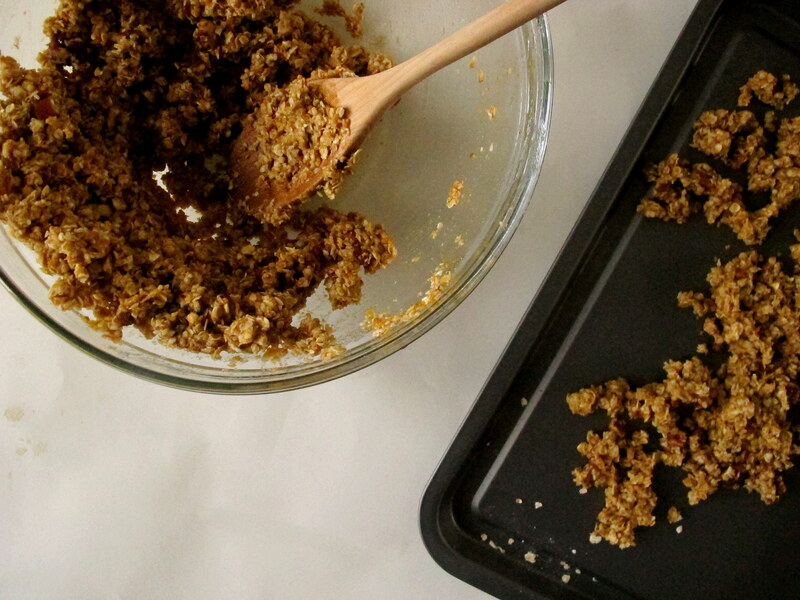 Spread the mixture on the largest baking sheet you can find and place in the preheated oven. 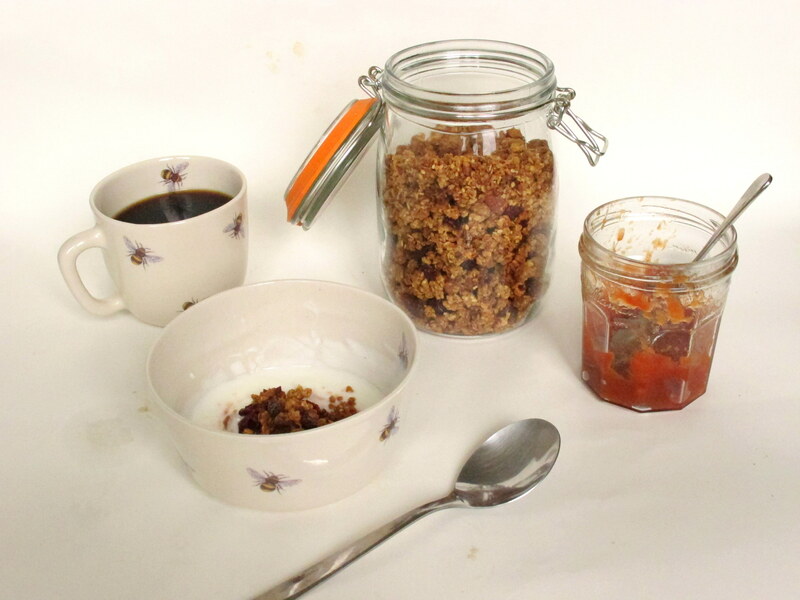 Keep checking every 10 minutes and break up the granola with two forks to ensure the mixture doesn’t stick together. Continue until the granola has been in the oven for around 35 to 45 minutes and feels dry. 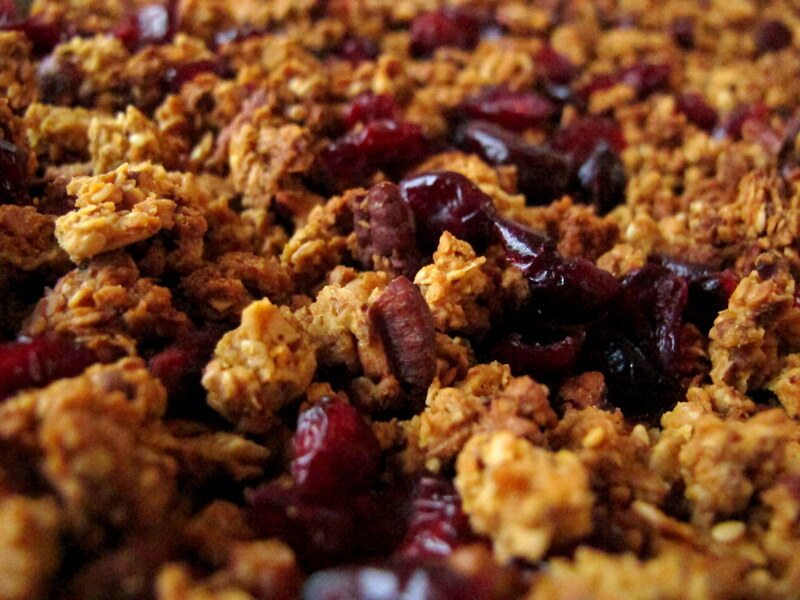 Remove from the oven and rest for a few minutes before stirring in the cranberry pieces. This will make the berries juicer when served as they soak up the heat from the granola. Once completely cooled, carefully scoop into a 1.5 litre kilner jar and store for 2 -3 weeks. I am currently enjoying this granola with some low fat Greek yoghurt let down with a little almond milk and a spoonful of my Quick Vanilla Peach Jam. How do you eat yours? July birthdays are the best. 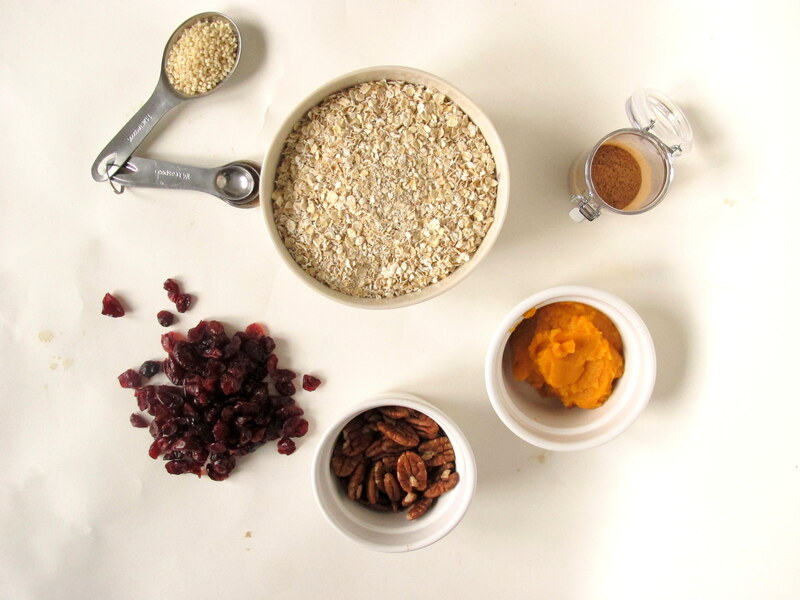 Still haven’t made granola but that sounds delicious!